Video poker is a combination of draw poker and the traditional slot machine. This popular casino game is straightforward to learn and is therefore accessible for all. In video poker, getting the highest possible poker hand is the most important thing of all. You can play video poker for free or for money at Royal Panda. At this popular online casino you can wager as little as $0.10 or as much as $5,000. If you register at Royal Panda now, you’ll receive a 100% welcome bonus up to ₹7500. Video poker is well known as a casino game with potentially high payouts and many means of betting. The size of your win depends on the combination of cards and the number of hands you play. A Royal straight flush could win you up to 250x your bet! What are the rules of video poker? The rules of video poker are very similar to the rules of poker. One difference is that you’re dealt five cards in video poker, and that you can play multiple hands simultaneously. There are various video poker strategies available for beginners and experts alike. Each video poker game has its own strategy that will increase your chances of winning. Should you wish to practice to increase your video poker abilities, you can play video poker for free online. Jacks or Better: a winning hand needs to have a minimum of two jacks. Deuces Wild: twos (deuces) act as wild cards, and can replace any other cards in the hand to create a winning combination. Joker Wild: the jokers are wild cards and increase your chances of winning. All American: winning combinations offer the prospect of higher payouts than in other forms of video poker. Tens or Better: a winning hand requires you to have at least a pair of tens. Video poker is based on five-draw poker, the original poker game that was first played in 1830. Video poker was first introduced to Las Vegas casinos at the start of the Seventies, and by 1989 it was one of the most popular casino games. 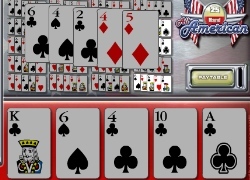 The arrival of online casinos also heralded the emergence of online video poker.